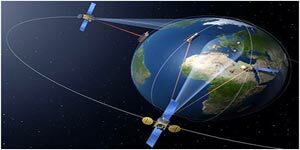 Commercial satellites systems are another major component of the wireless communication infrastructure.Geosynchronus system include Inmarasat and omniTRACS.The former is geared mainly for analog voice transmission from remote locations. For example, it is commonly used by journalist to provide live reporting from war zones. The first generation Inmarsat-A system was designed for large and rather expensive terminals. Newer generation Inmarsats use digital techniques to enable smaller, less expensive terminals, around the size of briefcase.Qualcomm’s omniTRACS provides two-way communications as well as location positioning. The system used primarily for alphanumeric messaging and location tracking of trucking fleets. There are several major difficulties in providing voice and data services over geosynchronous satellites. It takes great deals of power to reach satellites. So handsets are typically large and bulky.Geosynchronus satellites also have fairly low data rates, less than 10Kbps.For these reasons lower orbit LEO satellites were thought to be better match for voice and data communications. LEO systems require approximately 30-80 satellite to provide global coverage. And plans for deploying such constellations were widespread in the late 1990’s.O ne of the most ambitious of these systems, the Iridium constellation, was launched at that time. Although these LEO systems can certainly complement terrestrial systems in low-population areas, and also appealing to traveler desiring just one handset and phone number for global roaming, the growth diminished cost of cellular prevented many ambitious plans for widespread LEO voice and data systems to to materialize. An exception to these failures was the global star LEO system. Which currently provides voice and data services over wide coverage area at data rates under 10Kbps.